I wish now I had done it sooner. I just was too stuck in the thought of "not in this house, its not mine". it was because my environment didn't reflect me, didn't speak to me, didn't feed or nourish me through reflection.....didn't mirror what I have inside. I will never settle again. 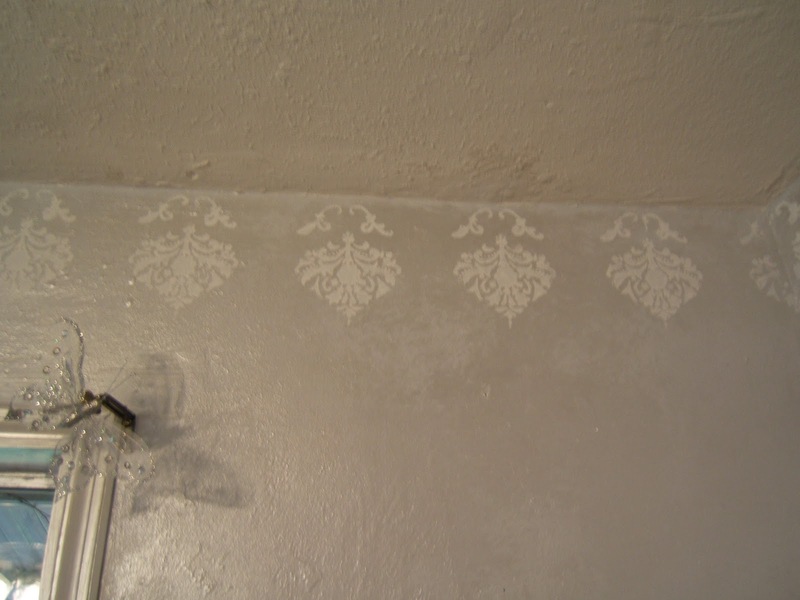 But its done now and here are some very unprofessional pictures. 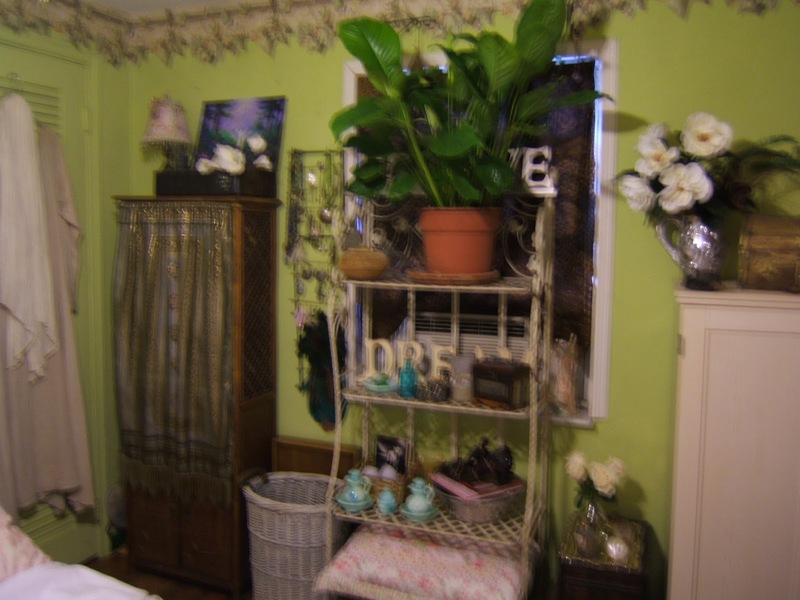 I talked about the inception of this room makeover, that I am "going white", and why I wanted to do it here . 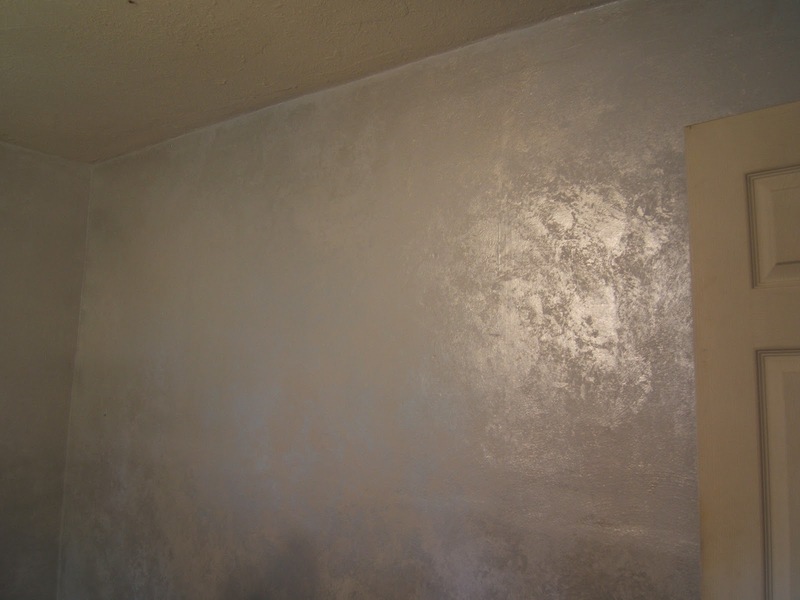 Then I talked about its update here with the progress of the walls and what happened there. 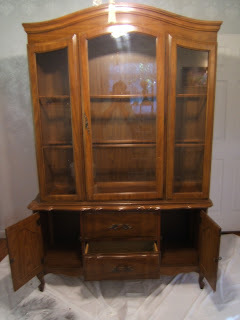 Then I talked about the next step in painting some of the furniture here. 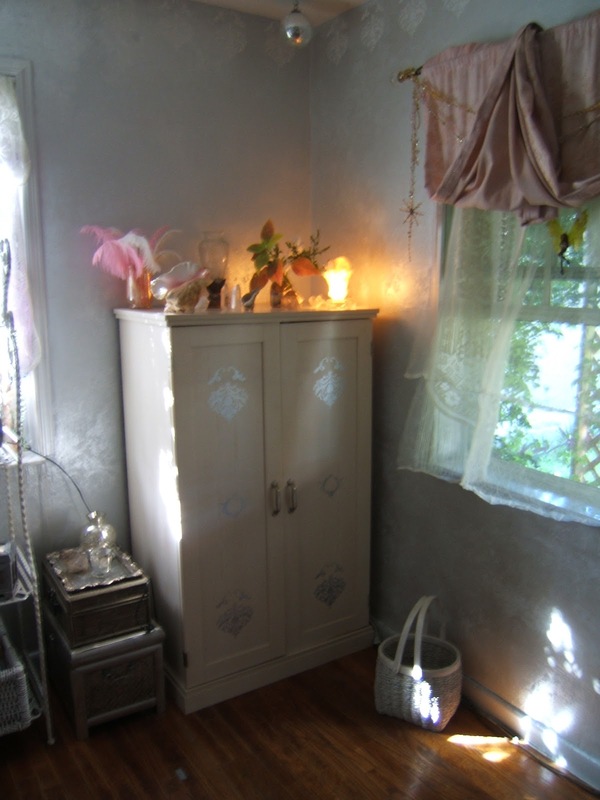 And then I talked about the major chalk painted "armoire" here and how lovely that turned out. So with those, if interested, you have most of the process, not including all the time and work. 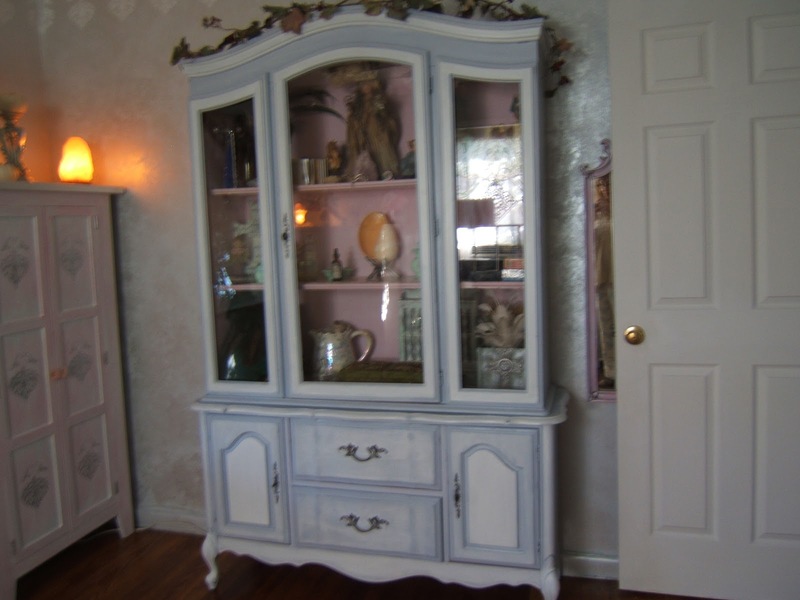 This project cost me $60.00 for the Armoire.....yes, Anita thanks for the correction lol.....and $35.00 for the Modern Masters White Pearl Paint, the other paints were bought for me by John in an exchange for what I bought him. 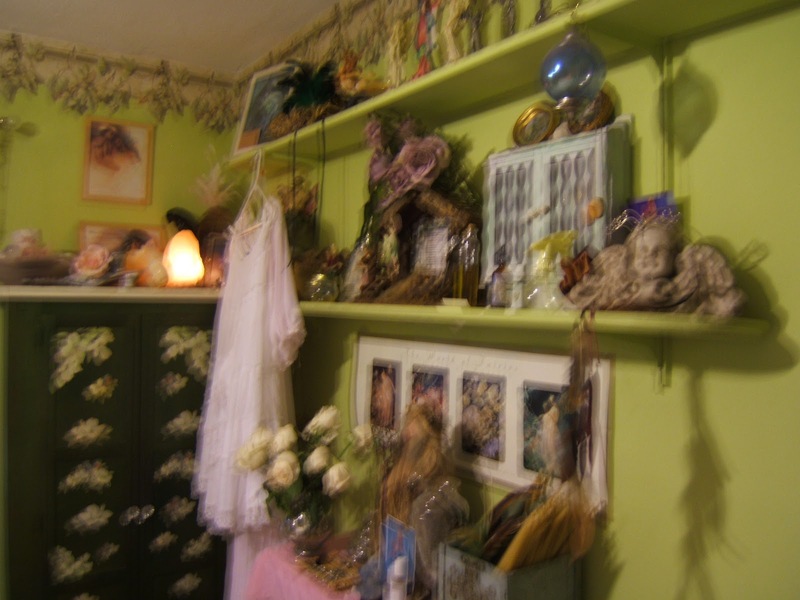 Same wall....all of the above things that were on the shelves etc are now in the French Armoir......and I have extra room! and now....still not finished, I have to find a nice way to display my earrings and yet put them away. And I have to put the large plant on the top shelf, I must have plants in my room, but I need to get a good pot for it now....but there are roses and other flowers there now. 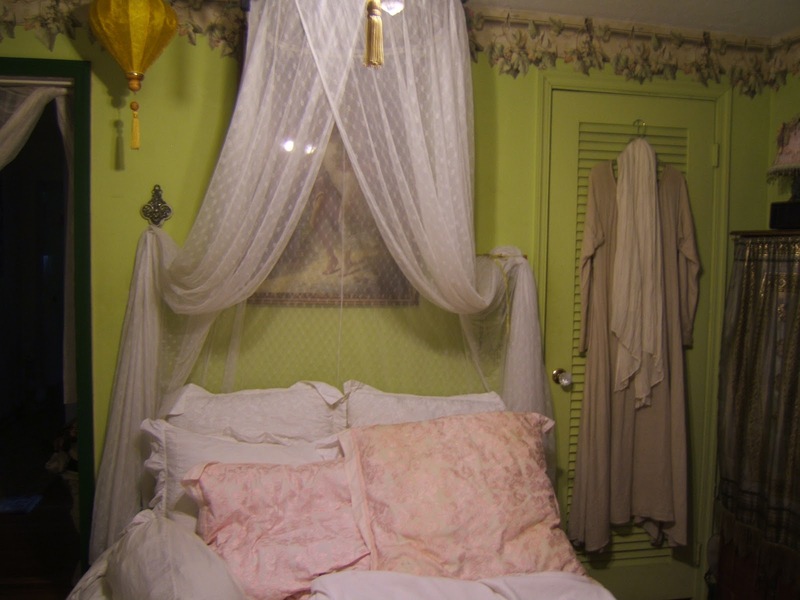 I love the airy feel. 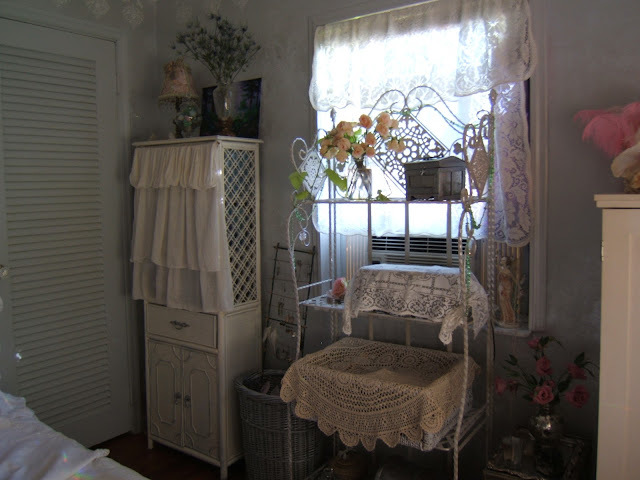 The radio is hidden under the lace and the CD"s are in the large basket also covered with lace. Bed side before.......everything about it is the same, but looks different against the silver grey walls! 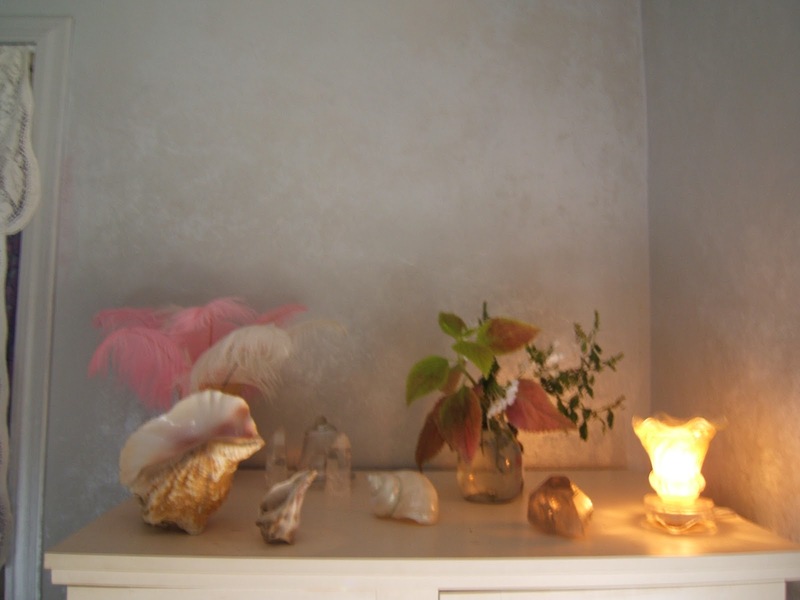 I wish you could see these prisms dancing on the walls and smell the lavender! 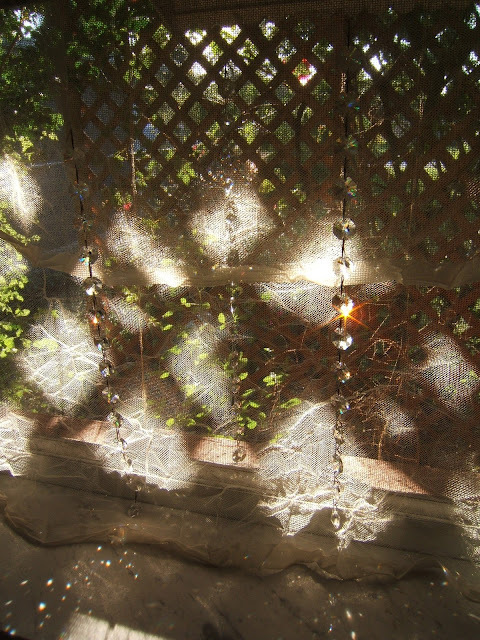 When I went to this company's site, Ethereal Decor , and read that they didn't do any special effects to this video, just put lights onto the moving strands, I knew these were for me. I already have some swarovski crystal prism drops in the four corners of this house I play with every morning and love their light, color and sparkle, so I have to make this tree. 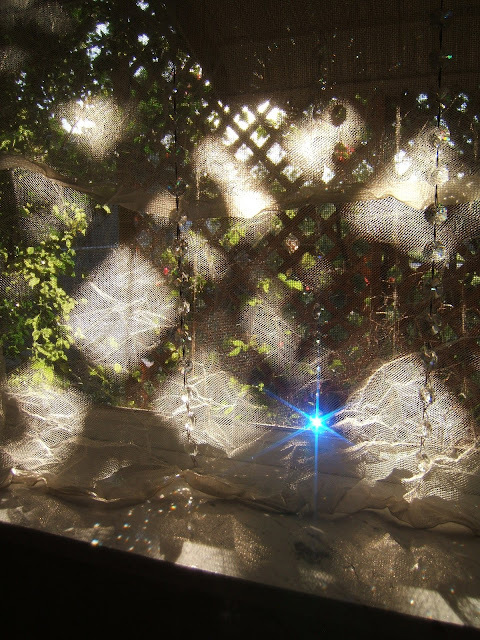 I have 3 strands hanging on the sheers and they do indeed produce those sparkly prisms which I caught on camera!. 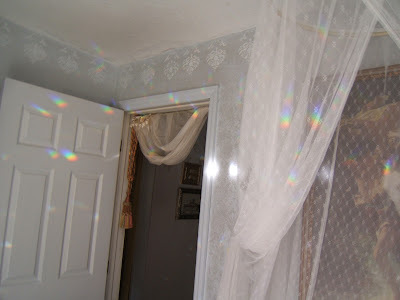 ..... and these crystal strands are what produce the prisms that shine all over the room and dance on the walls every afternoon LOL! 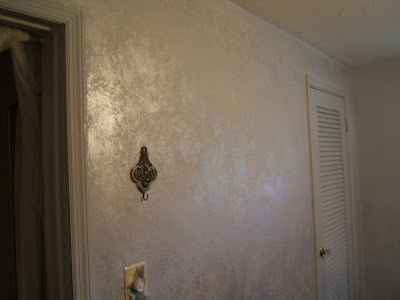 I have to say the best thing and surprise were the walls.....I was going for a pale grey/white pearl wall for a Mother of Pearl effect.....and I got silver walls which I absolutely adore. Everything that came in after the walls were done were simply icing on that cake.....because the entire room got a beautiful foundation which makes everything else nice. 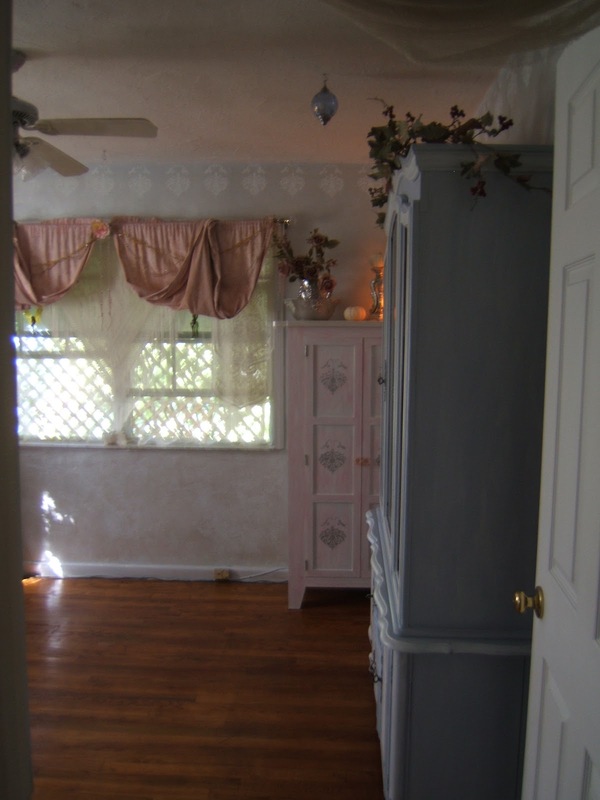 Painting the furniture was critical, and using the same color theme of whites, silver and pinks brought it all together. I had beautiful things, only they were not seen because there was too much going on. Now I just need to get a bench for under the window as the one there is too small and I need a place to throw my things at the end of the day LoL. Since I have done this, and though have suffered a great deal with pains, I did see how I need to keep going and am now going to tackle the living room. Last year I told my housemate John who owns this house that I wanted to do it but now that I've seen how I feel in my room I want to keep going now and extend this pristine and pretty feeling into the living room.....and on........no more waiting, for him or anyone. So I had a ''sit down'' with him and told him I will need help this time, and if he could help me paint or hire someone to paint the walls because I can not do this again alone, he said he would help paint the walls a little at a time....."a little at a time"....lol.... 'a little at a time' in his world means taking months, literally......so I will have to help him see new shores LOL :D This will all be done by Thanksgiving. 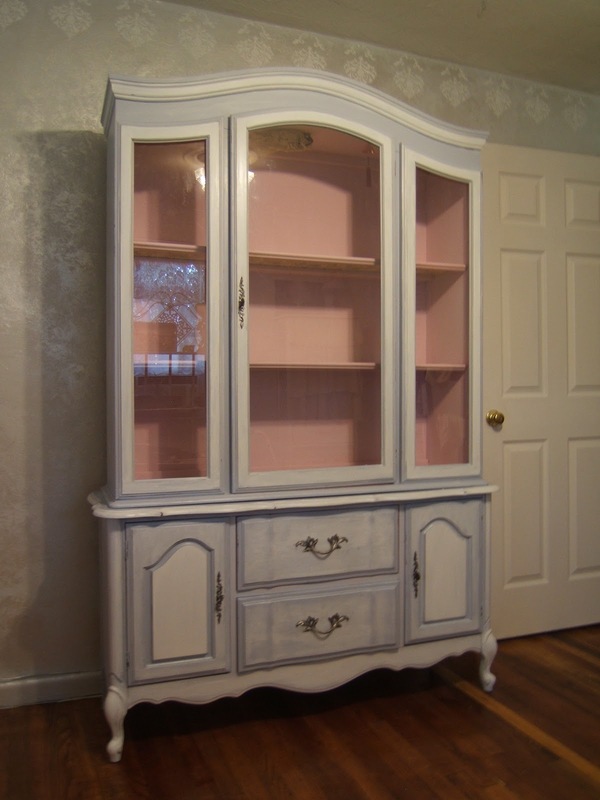 But I'm going to paint all the furniture myself which is currently all dark brown wood in beautiful neutrals of greys, whites, and taupes chalk paint style thanks to Annie Sloan's inspirations. The pale yellow walls he painted them 10 years ago are going to be Heirloom White, and everything in there will be harmonious too, and it is this harmonious blending of soothing colors which creates serenity. I will start that project next week, but will also take more time doing sections so as not to hurt myself again. I hope this has inspired someone and helped to encourage you to make any improvements you can now where you live now, and not wait.....its a waste to wait....now is all we have....and I love what I did! thank you Jill....yes it is feeling that way. I feel better but not sleep better....unless all the dog barking stops, and other things, but it feels much better. The prisms yes are the most fun and magical part lol. Isn't it amazing how it is the unexpected little things that make it? 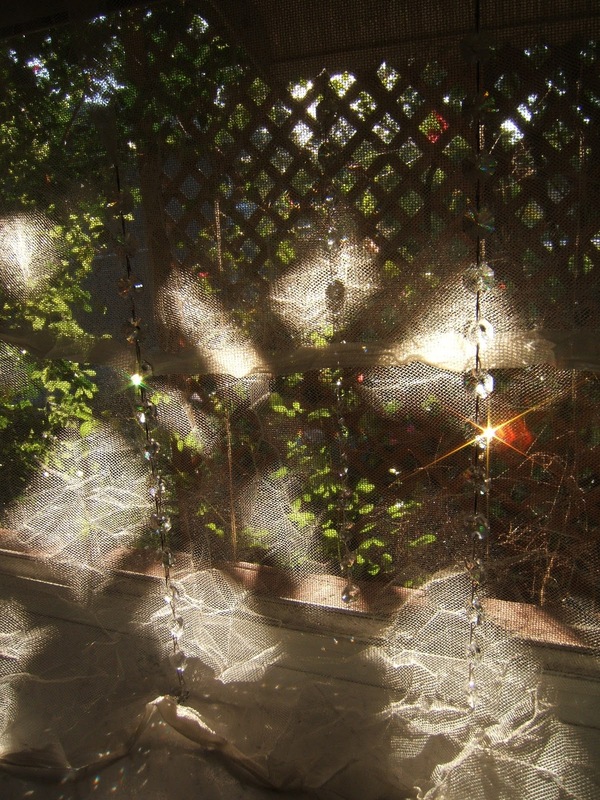 I will make a seperate post about the Crystal Prism Tree I'm making when it is done...how fun is that! Yes, I do love the white and am now going to move the white and shades of it into the living as I mentioned in my post....starting next week. Lots more work! But I will pace myself. I LOVE it, you did a fantastic job!! You may need to rest a bit before you tackle another room. I know that you put a lot into your room, you have changed everything. Enjoy, you deserve it!! I want some Crystals, they are so beautiful and magical, they speak to me! Have a great week!! Thank you so much for saying so. I will need to rest, am doing so now, and I learned my lesson let me tell you! I highly recommend the crystals for prisms, movement of light and play and sparkle and a touch of magic...definitely!... coming from one of the Fae LOL and I would go with swarovski, the best in sparkle quality! What a lovely room! Will it be like sleeping in a beautiful pearly shell? How romantic and light feeling. You might be interested in using woodfiller and stencils in your living room, they give such a wonderful bit of texture, and easy to do. I hope you are feeling better. woodfiller? how do you mean? wit the stencils? I'm interested. Please let me know what you mean so I can look into it! thanks so much! The prisms...the light...OMGoodness...that it was really put me over the edge! I have always felt this way about living in an apartment...that oh, it's just temporary...why do anything...but then I realized that we have been here for 12 years! Yes, its inspiring to me too to continue as I realized I've been short changing myself or cheating myself due to erroneous thoughts..."not here, not now, not enough money, etc'......only to live in dissatisfaction. Not acceptable for me anymore. I thank you so much for your enthusiastic comment it warms my heart. And yes Anita loves the prisms too, wish you could see them dance lol. And yes again, its a whole other dimension, more like the 5th which is what I wanted and why the word "Ethereal" best described it. Omgggg!!! it's so perfect beautiful...I love you turned it all in white. 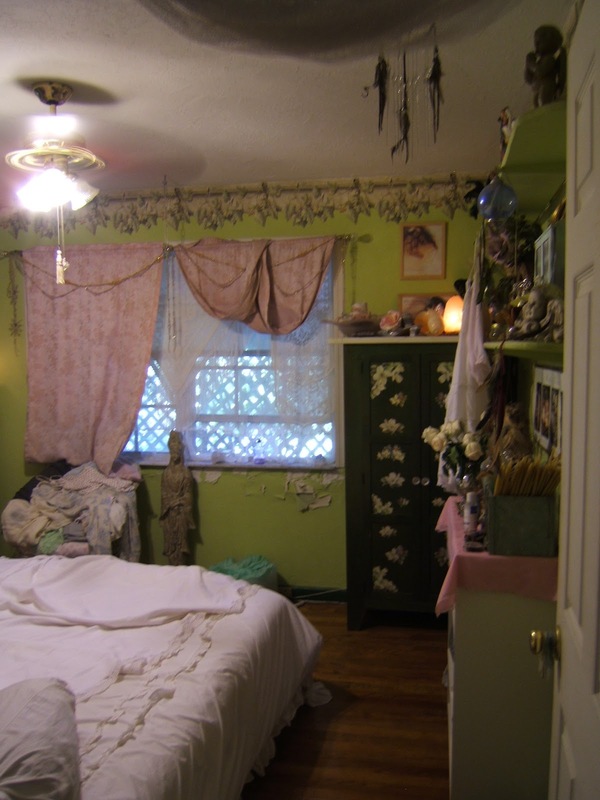 I love your room! 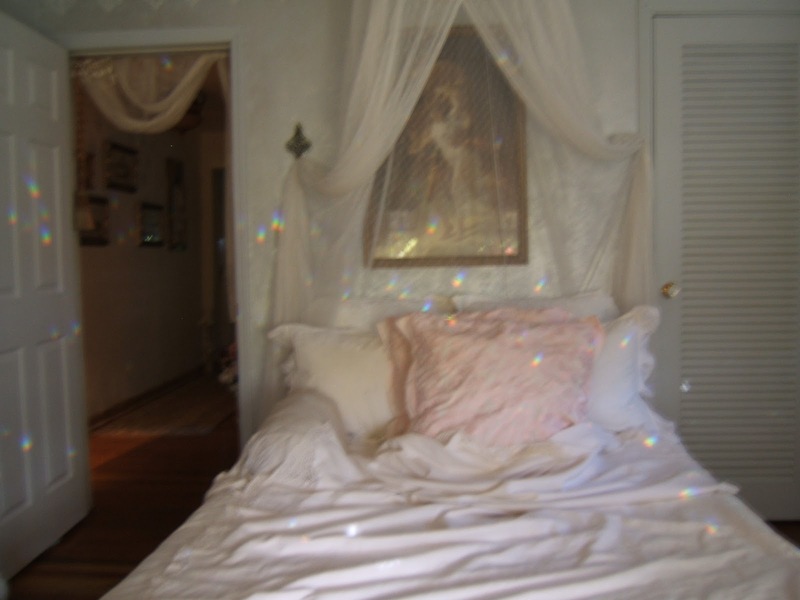 I would love to stay in your room for hours. You designed it so pretty and inspiring me! That must feel wonderful to get such a huge job done and it turn out so beautifully! You have done a lovely job and I'm so glad you love it. I think it looks gorgeous...and your new craigslist unit is lovely too. I can't wait to see the next room! 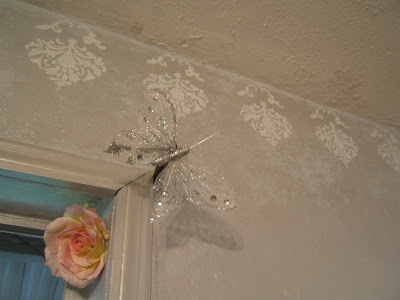 Thanks so much for joining me for Pearls and Lace Thursday! It does feel good Doni, every time I walk in there, its a magical feel....don't know why we procrastinate and take so long. I usually dont, but this seemed a big job that would require more money and it didn't, just alot of paint and creativity. I had beautiful things, but they were lost, I brought them out is all. Yes, the living room is next and my housemate got the wall paint today and even hired a painter! thanks to my convincing talk! 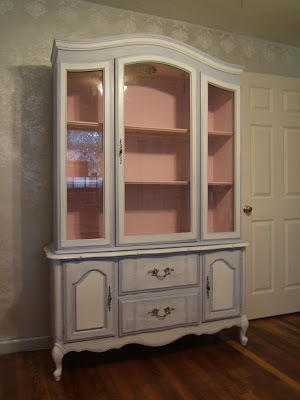 lol....but the furniture will be painted with the Annie Sloan real chalk paint and I will see how it is first hand. 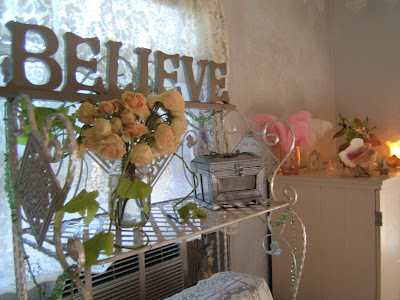 Lots of work ahead, twice as much as the room....but I'm not afraid....lol....the Beauty is worth it! it's LOVEly! 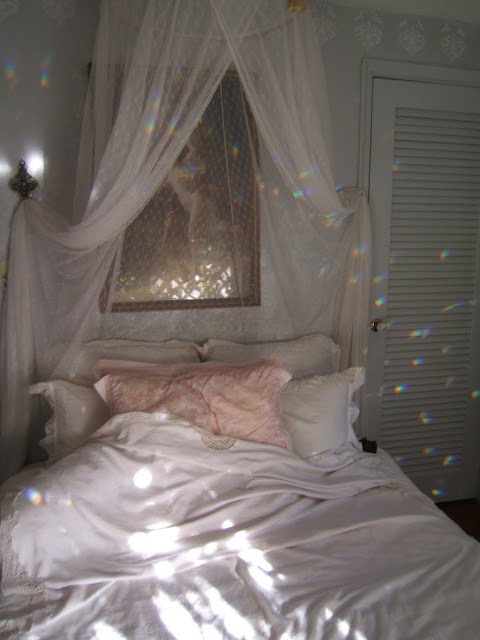 the prisms and colors and fabrics, all of it, ethereal relaxing soothing fairy heaven. very exciting you'll do the rest of the house. i do wish you find someone to help with the heavy work so you're not in pain this time! Yes, Kaisa, as of today, my housemate hired a painter thanks to my very convincing talking and finding one and having the idea in his head that he doesn't have to do any work!....lol....that won him over. He got the paints today, and I'll soon order the Annie Sloan paints for the furniture. I found out the causes of my pains and it wasn't the work, I emailed it to you, I can be so daft at times! Yes, it feels so much better, and I cant wait to start the living room too now. The housemate is going to have to learn that tomorrow is no way to do things, and I wont' do well with procrastination, I don't know how others live with it. I plan for it to be done by Thanksgiving, I just informed him tonight. Most of the work will be done by me anyway. Thanks for visiting! hummm, well I'll keep my eye out for that, but the windows are open and the breeze moves things so it should not be a problem. thanks. Wow! Just like I remember from "back home". You've replicated our world, Lady. It must feel blissful to be in that room. Truly, you have created a Higher Realm. Replicated our world, yes, :D is what the intention was. Imagine if I had $ to work with? It is a bit of a Higher space indeed. Thank so much for visiting and commenting! C'est Magnifique! Vous êtes un ange avec un talent superior et d'une univers de beauté.... Je te connais bien! Oui, vous me connaissez. Je vous remercie de me recevoir. This turned out beautiful! Love how the prisms sparkle! Thank you for joining Home Sweet Home! It's just beautiful! Such a soothing, soft place to fall at the end of the day. I love the whites. And of course the prisms are amazing. 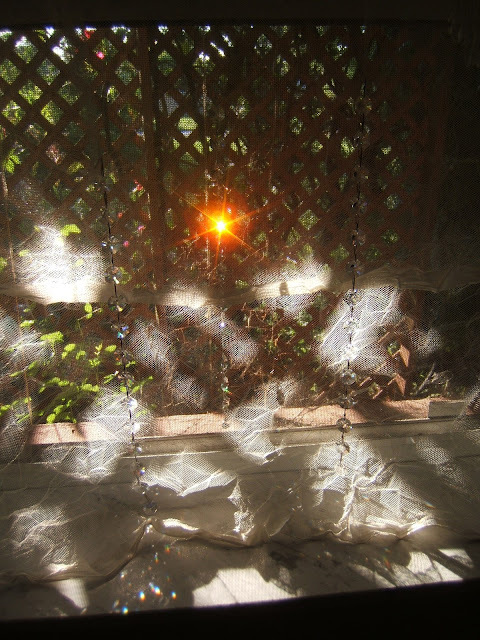 How lovely to wake up to the beautiful sparkle from the sun in the morning! You have done a beautiful job! Hello ~ I found your blog via TimeWashed White Wednesday. Your blog, and your room, is beautiful but may I make one suggestion? These old eyes of mine find your font very difficult to read (head-ache inducing) Maybe something a bit less ornate? 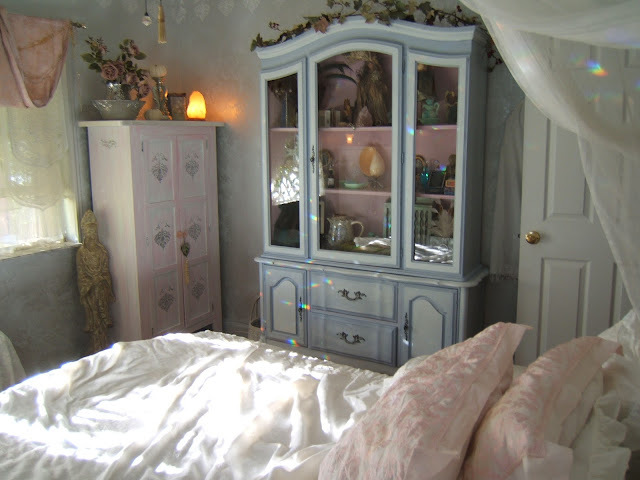 "Ethereal White Bedroom": Making it "Mine"
Sublime Time with Rose Crostinis and Tea!